In the years of 1831–1832, Michael Faraday discovered the operating principle of electromagnetic generators. The principle, later called Faraday's law, is that an electromotive force is generated in an electrical conductor that encircles a varying magnetic flux. 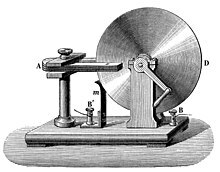 He also built the first electromagnetic generator, called the Faraday disk, a type of homopolar generator, using a copper disc rotating between the poles of a horseshoe magnet. It produced a small DC voltage. This design was inefficient due to self-cancelling counterflows of current in regions not under the influence of the magnetic field. While current was induced directly underneath the magnet, the current would circulate backwards in regions outside the influence of the magnetic field. This counterflow limits the power output to the pickup wires and induces waste heating of the copper disc. Later homopolar generators would solve this problem by using an array of magnets arranged around the disc perimeter to maintain a steady field effect in one current-flow direction.